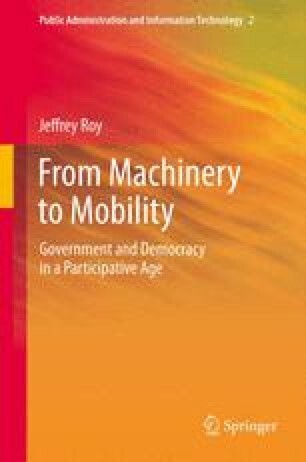 In parallel to more open and participative governance movements associated with mobility, there has been widening interest in linking the Internet with new forms of democracy. Underpinned by the wider canvas of the democratization of information across societies, proponents of reform and critics of the status quo have thus sought to foster an alternative paradigm less rooted in historical foundations and increments of change and more aligned with more virtual realities. Fueled by the widening capacities for spontaneous and grassroots mobilization, any such reform project nonetheless faces stiff head winds stemming from tensions between machinery and mobility. At the core of such tensions in terms of democratic processes is the challenge of deliberation.